I started I getting notices from Chill over the weekend that so and so is now following you. I thought Chill, Chill, nope definitely didn’t register for Chill. Saw some bewilderment from the FB crew which also experienced the Chill e-mails. Seems like some kind of automatic registration taking place. Anyway, will take a closer look at the platform this week. Hi Steven! I got a barrage of notifications as well from our crew so I took a minute to look into it again. I do remember signing up but I had not done much on the platform. I really do like the look of it. Did you guys get the 700 branch out and Pinterest notices too? This stuff is blowing up my e-mail. 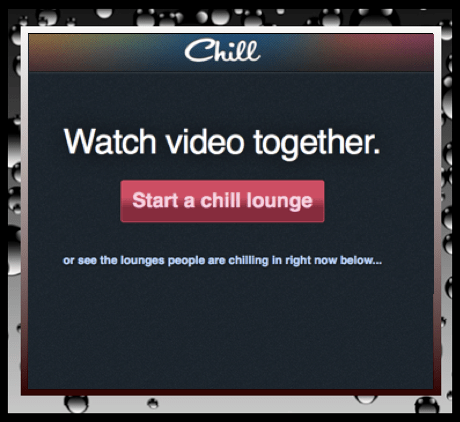 Chill reminds me of a combination between Pinterest, GetGlue & Google+ Hangouts. Sounds like a neat concept, but not sure how often I would use it. I have a ton of friends on GetGlue who post on Twitter what they’re watching all the time, but I personally haven’t gotten into the habit of even checking in when I watch something, let alone starting a video lounge. Could change when I join something like this. 🙂 Thanks for the review! Hi Morgan! It is a pretty cool concept, especially for those that watch and share a lot of video. It does have a really cool look to it, very similar to Pinterest, it did grab my interest and It did have a sticky element. So it could be a bit of a sleeper social media platform that can become addictive. Thanks for taking time to read and comment!